This space wallpaper is a long-exposure Hubble Space Telescope image of massive galaxy cluster Abell 2744. The image shows some of the faintest and youngest galaxies ever detected in space. This space wallpaper is a long-exposure Hubble Space Telescope image of massive galaxy cluster Abell 2744. The image shows some of the faintest and youngest galaxies ever detected in space. Abell 2744, located in the constellation Sculptor, appears in the foreground of this image. It contains several hundred galaxies as they looked 3.5 billion years ago. 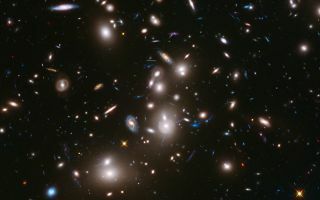 The immense gravity in Abell 2744 acts as a gravitational lens to warp space and brighten and magnify images of nearly 3,000 distant background galaxies. This image was released Jan. 7, 2013.